“Thinking Out Loud” is a song by English singer-songwriter Ed Sheeran, recorded for his second studio album, × (2014). It was written by Sheeran and Amy Wadge, and produced by frequent collaborator Jake Gosling. It was released in the US on 24 September 2014 as the album’s third single. 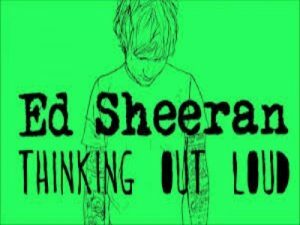 In June 2015, “Thinking Out Loud” became the first single to spend a full year in the UK top 40. In September 2015, it also became the seventh single to have achieved triple platinum in the UK during the 21st century. In October 2015, the song became the first to be streamed over 500 million times on Spotify, is also one of the most streamed songs in the UK and has been viewed more than 2.4 billion times on YouTube as of July 2018.